NOSAS members John Wombell and Jonie Guest have been organising a series of Ad Hoc coastal walks. The purpose of these walks is to observe and survey sections of coastline particularly after winter storms in order to interpret, record and note the condition of newly exposed archaeology, also to revisit and record possible threats to known structures and update the Scotland Coastal at Risk Project (SCARP) data base. There had been a great deal of Second World War (WW2) activity along this section of the Coast. Military activity continues even now with proximate areas requisitioned as bombing ranges. In January 2017 we walked between Dornoch Golf Course Car Park and Dornoch Bridge mainly recording the WW2 Anti Glider Poles. On 1st February 2017 John Wombell and Meryl Marshall led a group between Inver and Portmohomack, Tarbat Ness. Tarbat derives from the Gaelic for Isthmus but the area it comprises is perhaps better described as a peninsula. One township of particular interest to us was the proximate long abandoned Arboll (NH 8835 8283, HER ref. 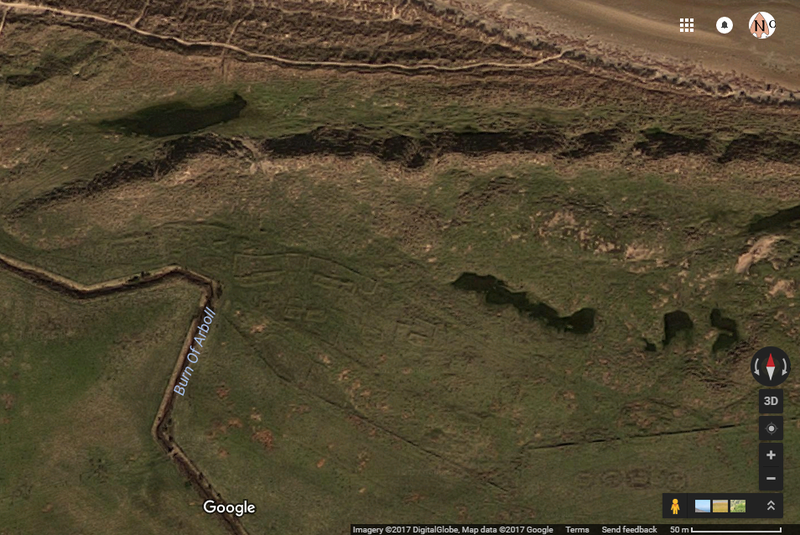 MHG8523 Canmore ID 15318) which can be seen on Google Earth reasonably well. Meryl Marshall and NOSAS volunteers had part recorded this in 2003. Meryl was keen to continue with her re-creation of the township. 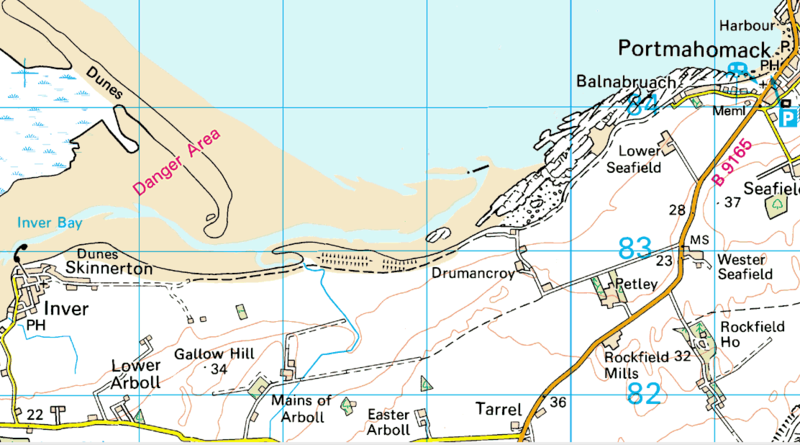 Arboll now refers to several scattered farms 10km East of Tain a short distance inland from the Dornoch Firth. Information with respect to the township of Arboll’s early history and eventual abandonment is sparse however David Findlay, NOSAS member and proximate resident, kindly sourced some maps and historical references. The 1984 Ross-Cromarty Book of the Northern Times Ltd suggests that the name Arboll derives from the Old Norse ‘bolstadr’ meaning a homestead with the first element of the name, also Norse, meaning Ark or Seal. Place names of Easter Ross also informs us that Arboll (Arkboll 1463 and 1535) is Norse ork-bol or ark-stead but perhaps orkin meaning seal. This entry was posted in Post Medieval, Surveying and Recording, Tarbat and Easter Ross and tagged Arboll, Arboll Links, bait mortars, cholera epidemic, D Day Tarbat, feal and divot, Fishertown of Arboll, Genies House, highland archaeology, Inver, Meryl Marshall, North of Scotland Archaeological Society, NOSAS, Place Names of Ross and Cromarty, Portmahomack, Post Medieval archaeology, recording a building, recording and surveying, seaware, surveying a village, tape and offset, Tarbat, Word War Two Tarbat Peninsula on March 30, 2017 by nosas.